Marriott Welcome Hotel a luxury five star hotel located in the posh south Delhi area of Saket is one of those very handful hotels in the city which have been drawing the attention of tourists from all over the world with its exquisite atmosphere and unparalleled hospitality. Green and clean ambience of this hotel with its mesmerizing beauty left all its visitors thrilled. By cherishing the great Indian tradition of cordial hospitality this hotel puts an everlasting impression on its visitors. Marriott Welcome Hotel which has been standing with all its grandeur in the lush green ambience symbolizes the great cosmopolitan culture of the city. Hotel with its splendid exterior and charming interior gives an all new dimension to the luxury. 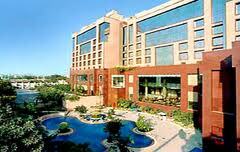 Its services and amenities are par excellence which makes you feel as comfortable as at home. This five star deluxe hotel offers you a wider range of Indian, Mughlai, continental and Chinese dishes and a good variety of drinks, you can binge upon. Hotel offers a better transportation facility to the different part of the city and places situated at the close proximity to Delhi. Marriott Welcome Hotel is located in the lush green quarter of the city with several tourist hotspots in the close proximity to the hotel. Having the advantage of being flanked by several hot tourist destinations, Hotel provides you with enough opportunity to visit all the major tourist points of the city in almost no time. In Marriott Welcome Hotel you will find Total 220 rooms/Suites - 8 Executive Suites, 51 Chambers, 160 deluxe rooms, One Presidential Suite. Staying at this hotel in the course of your holiday stay could be a magical experience for you attributed to its extensive range of services and facilities. ‘Hospitality at its core’ probably this would be your words when you will come across the world class amenities and services which are being provided at this hotel. 24 Hours Room Service, Bar Facility, Beauty Salon, Broadband Facility, Car Parking, Channel Music, Conference Hall, Credit Cards Accepted, Currency Exchange, Direct Dialing STD/ISD Facility, Doctor on Demand, Fax on Application, H/C Running Water, Hair Dryer, Health Club, Laundry, Multi-cuisine Restaurant, Newspaper in Room, Reception, Safe Vault, Swimming Pool, T. V., Travel Desk are some of the eminent services of the hotel. 15 km from New Delhi railway station this hotel.